If your idea of purr-fection is sipping freshly-brewed cups of coffee while cuddling with kittens, you’re in luck: a new business wants to turn that dream into a reality. WASHINGTON — If your idea of purr-fection is sipping freshly brewed cups of coffee while cuddling with kittens, you’re in luck: A new business wants to turn that dream into a reality. Although cat cafés have long been popular in countries such as Japan and Taiwan, the craze is just catching on in the U.S. The country’s first cat café opened in Oakland, California, in October, and in December, Manhattan welcomed The Meow Parlour. 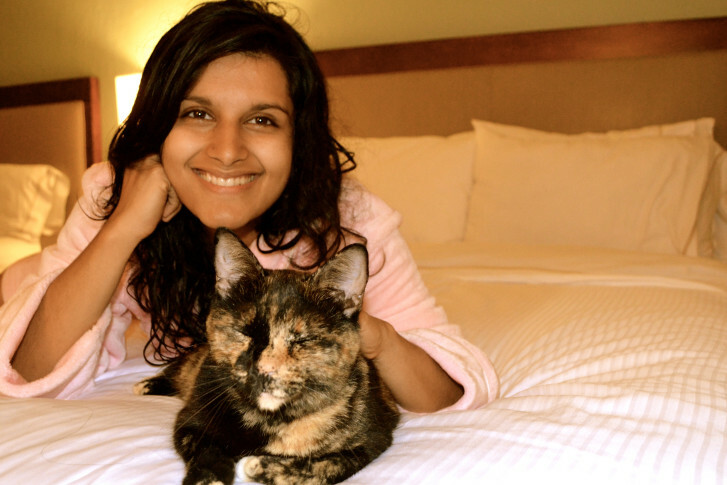 Cat cafés have long been popular in countries such as Japan and Taiwan, and the craze is just catching on in the U.S.
And if Gaithersburg resident Kanchan Singh has her way, D.C. is next on the list. She’s working to open the District’s first cat café, Crumbs and Whiskers, this summer. Singh, 24, first heard of the cat café concept while she was backpacking through Thailand last year. The self-proclaimed animal lover says the idea of visiting with cats in a coffee-shop environment intrigued her, so she decided to check it out. She never imagined her visit to a cat café would wind up being one of the highlights of her backpacking adventures. Now, she wants to share that experience with other Washingtonians. Not sure what to expect from a cat café? Singh recently chatted with WTOP about her upcoming plans. If you haven’t heard of a cat café, there’s no need to dig around for a definition. It’s pretty much exactly as it sounds: a café where people can play with cats. In the U.S., however, the cafés are a bit more limited than the ones in Asia, since U.S. health laws prohibit café owners from having animals in an establishment that makes and serves food. While cat cafés all operate a little differently, Singh says, most do not allow you to bring your own cat. “That could get a bit chaotic,” she says. Rather, cat cafés typically partner with nearby shelters to bring in cats that are available for adoption. “If you came into the cat café and there was a cat that you really connected with, you could adopt that cat and you could take it home,” says Singh, who plans to partner with the Washington Humane society for her business. They’re also a place where animal lovers who can’t have pets can spend some time with furry companions. “You either have a pet or you volunteer at a shelter if you want time with a pet. And there’s really no in between,” says Singh, who adds that she hopes Crumbs and Whiskers provides that middle ground. While some consider the combination of warm drinks, baked goods and fluffy animals ideal, the Department of Health isn’t as keen on the idea of animals hanging out in a business that serves food. Singh says when she first approached the Health Department, officials told her the idea was illegal, and they were reluctant to talk with her. But she didn’t give up. “Eventually, you kind of don’t go away and you keep bothering them, and they realize they have to at least acknowledge you and your idea and work with you,” she says. Now, the Department of Health is working with Singh on a few different ideas. For starters, officials told her if she wants to open the cat café, she could do so with two completely different, but adjacent, storefronts. Singh doesn’t love that idea, though. “I don’t like the idea of my customers walking in and getting their food, walking back out and then walking in to another door [to play with cats],” she says. She’s also exploring whether a “complimentary” model might work, like a clothing store that sets out cookies and lemonade for its browsing customers. “That’s not something the Department of Health oversees because … they’re not preparing food; they’re not serving food; they’re not changing for food — they’re just being nice hosts,” she says. The Health Department has yet to approve this approach. If they do, Singh says, she will likely charge a cover fee to offset the cost of offering free food and coffee, and reservations for a visit will need to be booked ahead of time. Either way, Singh predicts she will partner with an existing bakery to make and deliver items for the café. In a recent interview with The Washington Post, Singh refused to reveal details on a potential location for Crumbs and Whiskers. Shortly after the article ran, The Georgetown Metropolitan published an upcoming agenda for the Board of Zoning and Adjustment, which showed that Singh placed an application for a location in Georgetown at 3211 O St., NW. But Singh still won’t confirm plans for her location. “What I will say is that is a location we are looking at. And yes, obviously we have a zoning hearing for that, but there is no lease that’s signed, and that’s why I’m really not confirming anything,” she says. However, one thing is certain: Singh, who has four cats of her own, wants Crumbs and Whiskers to be in the District.